The Institute for Analytical Instrumentation was established in 1977 by resolution of the USSR Government as the parent entity of the Research & Engineering Association of the USSR Academy of Sciences. R&EA included a special design office with a pilot production site and several instrument-making factories of the Academy of Sciences. The originator of the R&EA and Institute was Vladimir A. Pavlenko, an outstanding scientist and designer, Corresponding Member of the USSR Academy of Sciences. Since its establishment, the Institute has been formed as a research center oriented at developing new methods and facilities for analysis of substances' structure and properties, and building unique instrumentation for scientific research. The Institute for Analytical Instrumentation, an institution of the Russian Academy of Sciences (IAI RAS) is among the organizations united by the Department of Nanotechnologies and Information Technologies of RAS providing the procedural and organizational supervision of the Institute. information technologies, automation systems, and mathematical modeling in scientific instrument making. The basically new methods of substance research developed by the Institute have won broad recognition. Among them are Electrospray, method of mass spectrometer analysis of high-molecular compounds; Glide Mossbauer Spectroscopy method of ultrathin surface layers research; pioneer efforts in generating nano objects by molecular beam epitaxy; bioactive object snap analysis methods. Traditionally, the Institute carries out research and development in mass spectrometry, Mossbauer and electronic microscopy, scanning probe microscopy, molecular beam epitaxy, separation methods of analysis etc.  On the basis of the Electrospray soft ionization method, bio-organic mass spectrometry is rapidly developing. Time-of-flight mass spectrometers (TOFMS) have been developed, with orthogonal ion input and ion sources of Electrospray and Nanoelectrospray type. LCMS, a chromatic mass spectrometer package, has been implemented for research into proteomics. In the last years, a philosophy of building multi-reflector TOFMS was developed for the full mass range.  A mass spectrometer is developed for isotopic analysis of actinides at the content level of up from femtogram units (concentrations of about 10-15) in man-made and vegetable samples for the IAEA non-proliferation control program.  On the basis of modeling of physical processes during the traveling of charged particles in electric gas dynamic fields, a two-stage interface is obtained for mass spectrometer ion sources with electronic atomizing for precision identification of nano bio objects. o A major achievement of the latest years was the Institute's contribution to the development of a range of special MTI-350 mass spectrometers for the national nuclear fuel complex. Integrated set of instruments for high-temperature diffractometry and X-ray analysis methods for research of substances in a nanoscale state. Automatic mass spectrometer with ionization in the sliding discharge plasma for analysis of solid-phase dielectrics and semiconductors (nano objects, powders, and massive specimens). Electronic microscope for chemical analysis in the research of solid-state nanostructure chemistry and in the diagnosis of the electronic and atomic structure of artificially localized quantum formations. Automated multi-functional set of instruments for depth-selective research into the phase and element structure and physico-chemical state of the surface and volume of condensed media, in particular nanostructures and nanomagnetics.  In nanophotonics, abilities of light-induced resonance control are researched. Experimentally studied is a series of reflective resonances generated by ultrathin components of D2 lines of a natural mixture of rubidium isotopes in oblique incidence. The contrast of the strongest reflective resonances 500%. Given a full inner reflection, a strong resonance interaction of laser radiation and an assembly of atoms was recorded in the near-surface layer about 0.1 μm thick. The prospective applications are quantum information and quantum optics.  In cooperation with the semiconductor heterostructure physics laboratory, A. F. Ioffe Institute of RAS, we build basically new instruments on the basis of arrays of regular quantum points (lasers, LEDs, transistors, absorbers etc. ), and nanobiological sensors to detect ultra-low quantities of bio objects, including recording of single molecules and viruses. Automation systems are being developed for control and research of properties of in situ grown structures.  Using the MBE method, we synthesized quantum dots points (DP) of InAs/GaAs, given a pre-critical thickness of deposited layer (in an interval of 1.4-1.5 InAs monolayers ) on vicinal GaAs surfaces (001) to provide an ultra low DP density of (3 - 30) μm-2. It was shown that similar nano objects have a higher brightness and a narrower photoluminescence (PL) line compared to ordinary DP's. "Pre-critical" DP's may be used to develop single photon emitters.  Using the MBE method, we obtained basically new heterostructures consisting of an InGaAs quantum well structurally connected to an InAs quantum point via a "nanobridge", which is a nanowire (one-dimensional InGaAs structure), greatly reducing the time of radiating recombination from DP.  The methods of scanning probe microscopy (SPM) were used to research the kinetics of mechanical emission of electrons from a local nanocontact, and its dependence on the value of electric voltage between the sample surface and extraction electrode. The results obtained form the physical basis for creating a new SPM, a method for micro- and nano-diagnostics of materials. Precision traveling and scanning systems for SPM are being developed.  The Institute has developed a cell subpopulation detector for automated analysis of the subpopulation structure of assemblies of immune competent cells or other micro-objects with the use of entered fluorescent tags. A method of cytometry using microscopic images of cells is implemented. Individual cell parameters are found and defined with the aid of fast algorithms of digital image analysis, at the rate of over 300 cells/s, and with a sensitivity threshold of about 300 fluorochrome molecules per cell.  We are developing analytical instruments and analysis methods for nano bio objects on the basis of microfluid chips. Prototypes of analytical microchips have been made for a highly sensitive molecular diagnosis method, i.e. molecular colony technique (MCT) with a reaction chamber of glass, poly(methyl methacrylate), polycarbonate, and aluminum.  We have implemented a basically new approach enabling measurement of an initial quantity of a specific DNA (RNA) in a sample in a broad dynamic range from single to 109 copies. By presenting amplification as a ramifying process with two types of particles, precise identification of single copies is enabled. A line of ANK instruments is made for real-time PCR-based DNA and RNA analysis.  Synthesis technologies are developed for hollow and monolithic capillary columns with preset physico-chemical parameters of the sorbent. For the first time, electron beam processing was used to modify a quartz surface and to synthesize a polymeric sorbent. Its prospective application is electric chromatography.  We have studied the processes of generation of immune precipitation patterns (IP) in gel as a result of diffusion and interaction of proteins of "antigen" and "antibodies." Mathematical models of IP generation in gel are developed. The basic limitations on Mancini's method accuracy are defined when finding the concentration of blood serum proteins.  In the field of acoustophoresis, research and development is going on in two directions: the first one is based on application of the effect of spatial separation of liquid dispersed system components in an ultrasonic standing wave field; the second one, on application of a new fractionation principle - "flow ultrasonic selection." At every stage of building and operation of analytical equipment, the Institute develops mathematical modeling, calculating experiments, computer processing of large data arrays, instrument control automation, and signal and image processing.  We have developed computer models of ion traveling in electric gas dynamic fields of gas-filled (pressure of a few Torr units) radio frequency transporting channels. The conditions of spatial capture and compression of ion beams are identified. On the basis of ion optical modeling, multistage interface designs were tested and experimentally proved for time-of-flight mass spectrometers, with low ion losses during their transport from gas dynamic ion sources to analyzers.  Based on development of the ion optical theory, we proposed and experimentally proved new designs of vacuum transporting interfaces for devices for orthogonal ion input into time-of-flight mass spectrometers with high energy ion collimation, described by high transmission and operating stability.  A computer model of a gas-filled magnetic separator is developed. On the basis of mathematical modeling, an ion optic pattern of a new generation separator for superheavy element research was proposed. 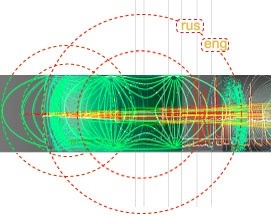 The effort resulted in the development of an ion optic pattern of such separator for the Laboratory of Nuclear Reactions, Joint Institute for Nuclear Research (JINR, Dubna).  An original approach to development of algorithmic and software tools of research instrument automation systems has been proposed on the basis of a new wavelet class known as hardware-oriented wavelets (HOW). The application of HOW allows to noticeably increase the sensitivity of instruments and improve their resolution.  A general theory of occurrence of a super-resolution mode has been originated for a time-of-flight mass analyzer based on periodic electrostatic systems functioning in the nonlinear Hamilton's autoresonance mode.  Mathematical models are developed to evaluate behavior of microparticles in a standing wave ultrasonic field, both in the flow and static mode, during sorption of substances to particles' surface, and models of ultrasonic oscillation propagation in multilayer tubular systems. A new approach to calculation of forces of ultrasonic radiation pressure on dispersed system particles in an arbitrary field is proposed. The scientific results formed the basis for developing new analytical instruments such as mass spectrometers for isotopic, element, and bio-organic analysis; Mossbauer spectrometers; ANK-4, -16, -32, -64 analyzers for real-time PCR, DNA sequenators, DSKF-01 laser cell analyzers; NANOPHORE® liquid sample chemistry analyzers; immune analyzers; sample treatment instruments; etc. The instruments made by the Institute and terms of their ordering are presented in the "Instrument Catalog". The Institute's developments are supported with programs of the RAS Presidium and Departments, federal and regional research programs, programs of Russia's Ministry of Education & Science, Federal Medical Biology Agency, Ministry of Nuclear Energy, Russian Fundamental Research Foundation, INTAS, IAEA etc. The Institute offers postgraduate studies, and has a Board for doctor and candidate thesis defense in Specialization 01.04.01 "Instruments and Methods of Experimental Physics." Since 1991, IAI RAS has been publishing the academic journal Nauchnoye Priborostroyeniye [Research Instrument Making]. The periodical is on the VINITI reference journal and databases, on the database of the Russian Science Citation Index (RSCI), and on the Higher Attestation Commission's journals list. Information on the journal is annually published in "Ulrich's Periodicals Directory", an international periodicals reference system.